Despite a history of gender stereotyping in cartography, there have been a large number of remarkable female mapmakers dating back to the earliest days of the endeavor. One of the first city mapmakers was Mary Biddle of Philadelphia, who not only drew the original street maps of the City of Brotherly Love but who also had ten (ten!) kids in her spare time. There was also Emma Hart Willard, who mapped Native American populations in North America; Kira B. Shingareva, who literally drew up the dark side of the moon (without Pink Floyd’s help); Florence Kelley, who illustrated poverty and immigration status with maps; Marie Tharp, who described the ocean floor using bathymetry; and Phyllis Pearsall, who thought up, designed, and produced the A-Z street atlas of London (just to name a few). Surely by now you’re wondering whether L.A. has any prolific female mapmakers. Of course we do! Why else would we be here? 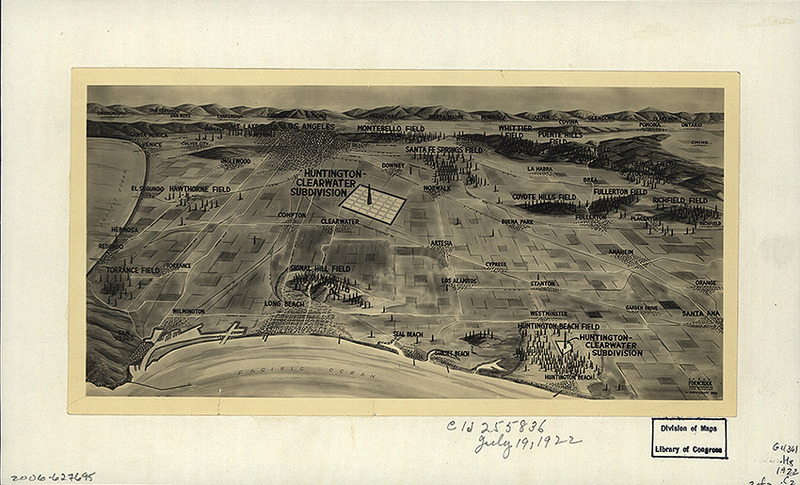 There were several female mapmakers who dealt with Los Angeles or Southern California in the 20th century: Ruth Taylor White, Louise E. Jefferson, Alice York, Odin Waugh, and Alice Klarke all were part of the pictorial map resurgence. 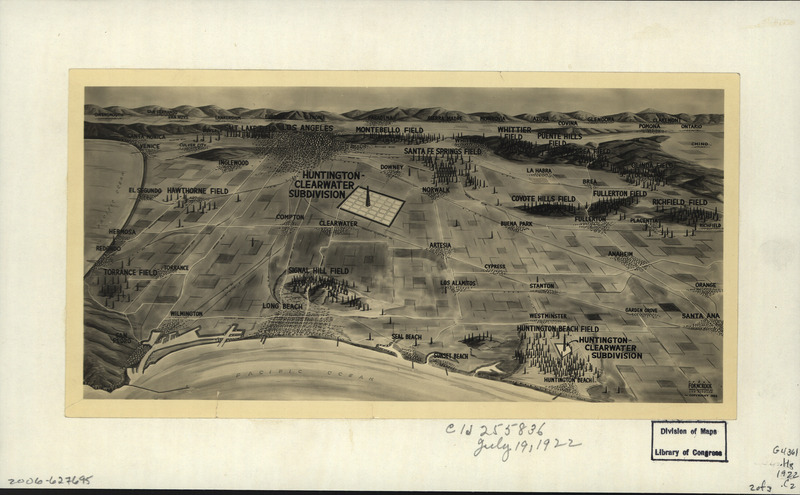 In honor of Women’s History Month (and in a nod to our call for nominations for the 2015 L.A. Woman), we salute today the work of Edna M. Forncrook and her pictorial of the oil fields in Southern California. Born Edna Beaufait in Detroit, Michigan—where she attended art school—Forncrook moved to California, where she eventually met her life and art-mate, Clarence. The two married in 1908 in Northern California, and by 1915, the Forncrooks had welcomed a baby girl named Viola. The family lived in Long Beach, where Edna and Clarence worked as graphic artists for the Long Beach Show Card Company. In 1922, the Forncrooks were commissioned to map the oil fields of Los Angeles, the most thoroughly drilled area in America. Edna’s drawings of a series of derricks all jammed together perfectly re-create the frenzied rush to pump black gold out of the fecund ground of Southern California. The map proved to be extremely popular and ended up in the Library of Congress in an effort to demonstrate the oil booms of Los Angeles. Edna and Clarence continued their successful graphic arts careers until a vacation to Lake Arrowhead ended in tragedy, when the young (37 years old) Edna drowned while swimming in the lake on August 5, 1928. Worth noting on the Forncrook map is the westward spread of the Salt Lake Oil Field, seen in the foreground near Los Angeles proper, with its derricks sprouting up from the flat ground. While this map shows the area during the second great oil boom of the 1920s, Salt Lake dates back to the first digging around the La Brea Tar Pits, where dairy farmer Arthur Gilmore found the bubbling crude in his fields in the 1890s. The Salt Lake Oil Company was the first to drill in the vicinity, finally getting a producing well in 1902. This field, near today’s Beverly Center and Cedars Sinai Hospital, peaked around 1908; by 1917, the company had set up over 450 wells. Some 50 million barrels of oil were brought out of the Salt Lake Oil Field. When the wells ran dry, the enterprising Earl Gilmore (son of dairy farming Arthur) used the land to build two sports stadiums: Gilmore Field and Gilmore Stadium, which would later become The Original Farmers’ Market plus CBS Television City.